DES MOINES, Iowa -- Bernie Sanders says he has one hope to pull off an upset win in the Iowa precinct caucuses over party frontrunner Hillary Clinton: high voter turnout. “Here’s my prediction to you. On election night, if voter turnout is high, you can go to bed early, we win,” Sanders told reporters at the very last stop of a recent rainy two-day swing through Iowa. The candidate then paused for a moment. 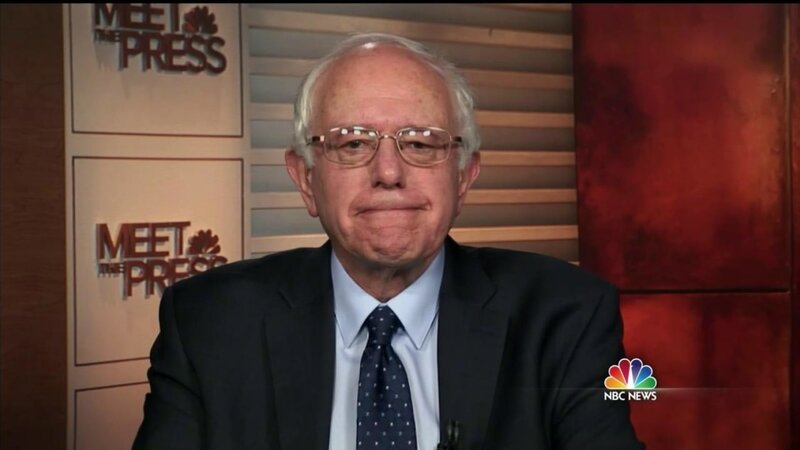 “If the voter turnout is low, we probably will not win,” the Democratic presidential candidate conceded. Turnout and bringing new people into the electoral process have been staples of the Sanders message from the outset of his campaign. But amid recent polling, the voter data battle with the Democratic National Committee, and the caucuses rapidly approaching, there is still no guarantee this strategy will succeed this cycle. “[Sanders] has gotta have turnout on a scale of 2008” in order to secure a caucus victory argued David Yepsen, a 34-year political journalist from The Des Moines Register and the current director of the Paul Simon Public Policy Institute at Southern Illinois University Carbondale. In 2008, Iowa's Democratic caucus participation was unprecedented and record breaking with about 240,000 Democrats turning out, contrasted with around 125,000 caucus participants in 2004. Then-Senator Barack Obama won the caucuses in ’08 by capturing a staggering 57 percent of caucus goers ages 17-29 and over a quarter of all first-time caucus attendees. That's the playbook Sanders hopes to replicate. According to the latest Iowa Democratic Des Moines Register/Bloomberg poll, while Sanders trails Clinton 48-39 percent, the Vermont senator maintains leads over Clinton among likely caucus goers under the age of 45, independents, and first time caucus goers. “Our job is to expand the definition of people who feel comfortable going to a closed party event, and to expand the turnout because of that,” asserted Pete D’Alessandro, who runs Sanders’ Iowa operation. Experts observed, however, that at this point there is not a lot of evidence to suggest that these demographics will turn out enough to disrupt Clinton’s leading position. Among those recent Democrats polled, 46 percent said they could still be persuaded to support another candidate. But the pollster who conducted the survey, Ann Selzer, pointed out that only 35 percent of Clinton supporters said they could be persuaded to support someone else at this time. Among Sanders fans, 45 percent said they could still be persuaded to support a different candidate. “I doubt this turnout will be as large as 2008 because a lot of Democrats are saying 'game over,’” added the Iowa political veteran, with regard to a potential Clinton caucus victory. The brief suspension of the campaign’s access to the Democratic National Committee’s voter database system could have threatened Sanders’ goal of turning out new caucus goers as well. “They’ve probably entered a whole bunch of new names into the database that weren’t even in there, with new registrations, with 17-year-olds, and all of their contact information,” noted Pat Rynard, a Democratic activist and editor of the political blog Iowa Starting Line. With fewer than 50 days left until the caucuses, Sanders has said he intends to come to Iowa more, as he has lagged behind his competitors in terms of visits to the state over the past two months. But the insurgent campaign calling for a “Political Revolution” is not neglecting retail politics nor relying on star power, television, or rallies alone to ensure they have caucus support. “It’s great to bring people out in great numbers at a rally, but we got to get them out on election night, and on caucus night. That’s what we’re working on right now,” Sanders told the press. In his first post-Thanksgiving two-day trip to Iowa, Sanders boasted that he reached over 5,000 Iowans through thirteen diverse events including private roundtables, larger stump speeches, town halls, and notably a forum on race, poverty, and prison reform at an elementary school in Anamosa, Iowa. This particular forum attracted a few hundred people in a town with a population less than 6,000 and featured two African-American men who told their stories of hardship upon leaving jail. Sanders led a discussion between these men and the audience as if he were conducting a master class on the subject of prison reform. The crowd was fully engaged. These are exactly the types of more intimate and unique events that the Sanders campaign hopes can draw in new caucus goers. "There were 350 people in that room and not one of them was a usual suspect who would show up for events like that in that county,” D’Alessandro told NBC News. "They weren’t part of the pool of people for when the smart people look [to see if] there’s gonna be turnout,” he added. Another aspect of following in Obama’s footsteps? The campaign has focused heavily on the more liberal Eastern side of the state—where Obama won the majority of his counties in 2008. Sanders events in Iowa in 2015. 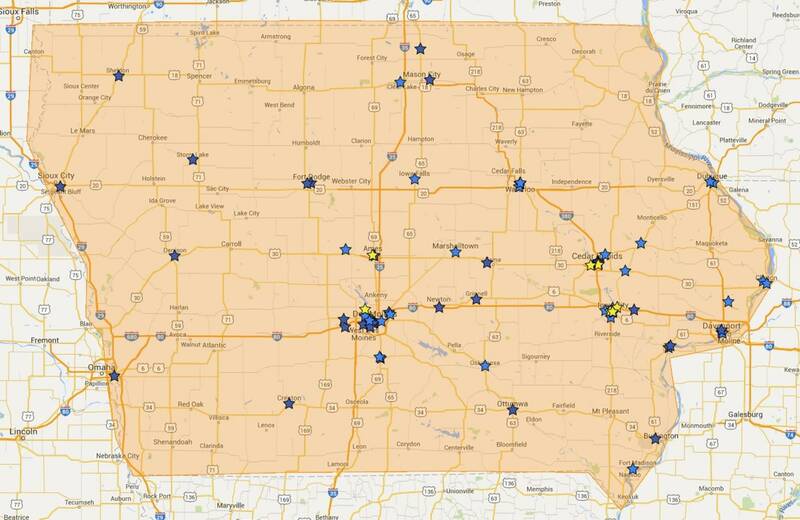 Yellow stars indicate visits before his campaign announcement; blue stars indicate visits after his campaign announcement. Google Maps, p2016.org. Obama was also known though for having a strong presence across the state, and Sanders will return to the more conservative western side of Iowa in the days leading up to Christmas for the first time since the summer. On the ground, Sanders has built a comparable organization to Clinton’s. Sanders has 23 field offices across the state, and 87 paid staffers according to his campaign. Clinton has 24 field offices and 78 paid staffers based on the campaign’s most recent public numbers from September. Before Sanders arrived at his Davenport field office Sunday night, organizers were sifting through and attempting to dry soaked maps of houses to knock on called “walk sheets” as volunteers returned from canvassing for hours in the rain. One drenched volunteer—part of a larger group of volunteers who regularly drive up from Missouri to help knock on doors in Iowa that weekend—Ed Weissler teared up when speaking about his dedication to the Sanders campaign. His main objective? Getting people to commit to turnout to caucus, even though he himself cannot participate being from out of state. “It’s what I have to do,” Weissler explained proudly wearing several Sanders pins, "It’s important and it has to happen now."